Black Sabbath’s classic 1975 track Symptom Of The Universe features the greatest riff of all time, according to the new issue of Metal Hammer magazine. We asked some of metal’s most proficient players to name their favourite riffs – and Tony Iommi's slab of Sabotage majesty saw off all competition to climb to the top of the 50 best. Zeal & Ardor’s Manuel Gagneux says: “Symptom Of The Universe further cements Tony Iommi as a riff machine! The palm-muted opening notes get their unmistakable sheen from the thin strings he uses. 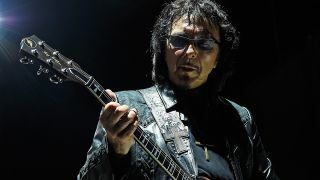 Speaking to Metal Hammer, Sabbath icon Iommi says that back in 1975, he wasn’t in competition with anyone else when it came to riffs… except himself. He adds: “I would always try to come up with more and more inventive ideas – different tunings, changing the amps, just fiddling about with the guitars really. A feature on the top 50 greatest riffs of all time, which also includes the stories behind them, can be found in the new issue of Metal Hammer magazine, which is on sale now. The issue is dedicated to the very best guitarists in rock and metal and also features Metallica’s Kirk Hammett, Zakk Wylde, Daron Malakian, Lzzy Hale and Matt Tuck.